The Teradek VidiU Pro builds on the success of its siblings and goes way beyond. Featuring ground breaking ShareLink technology providing a rock-solid connection, this next-generation multi-purpose streaming device ticks all the boxes. VidiU Pro, like the original VidiU and the new VidiU Mini, streams to Teradek’s Live:Air iPad Production Suite and to any online video platform using RTMP. It further simplifies the process by integrating APIs from several new CDN partners such as DaCast, Ooyala, Akamai, and Azure, along with popular favorites Ustream, Livestream, YouTube Live, and Wowza. During mission critical broadcasts, Zixi’s streaming protocol can be used to ensure your stream reaches its destination reliably, despite challenging network conditions. For added peace of mind, VidiU Pro can also be remotely managed using Teradek’s Core platform so you can always keep an eye on the status of your stream. To make broadcasting online even easier than before, the VidiU Pro introduces Teradek’s exclusive new LiveLink technology. To set up, you simply use the companion app on your smartphone to frame your shot, sign in to any online video platform, and hit a single button to “Go Live”. The VidiU Pro receives all the pertinent information via Bluetooth, and then seamlessly connects to the Web using one of it’s own network interfaces, or via the smartphone’s 3G/4G/LTE data connection (depending on your preference). The details are all taken care of under the hood, with fewer steps and less complexity than ever before. If the throughput or reliability of the network connection at your event is inadequate, the new ShareLink feature combines the resources of up to four network interfaces together into a single robust link. ShareLink can mix and match network types, so you can combine your smartphone’s LTE network with your wired network, or even combine the uplink capability of 4 smartphones. In addition to the new streaming options, the device has a new internal design, offering dual band 802.11 a/b/g/n/ac WiFi and a new network processor that offers faster data throughput over any network. 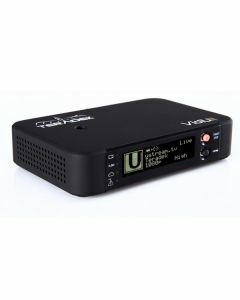 Like its siblings, the VidiU Pro includes a high capacity Li-Ion battery with over 2 hours of untethered run time, an HDMI input, and Bluetooth connectivity for quick and simple stream configuration. As an added benefit, VidiU Pro also includes an SD card slot for on-board recording, allowing you to save H.264 video files while you stream to the Web.